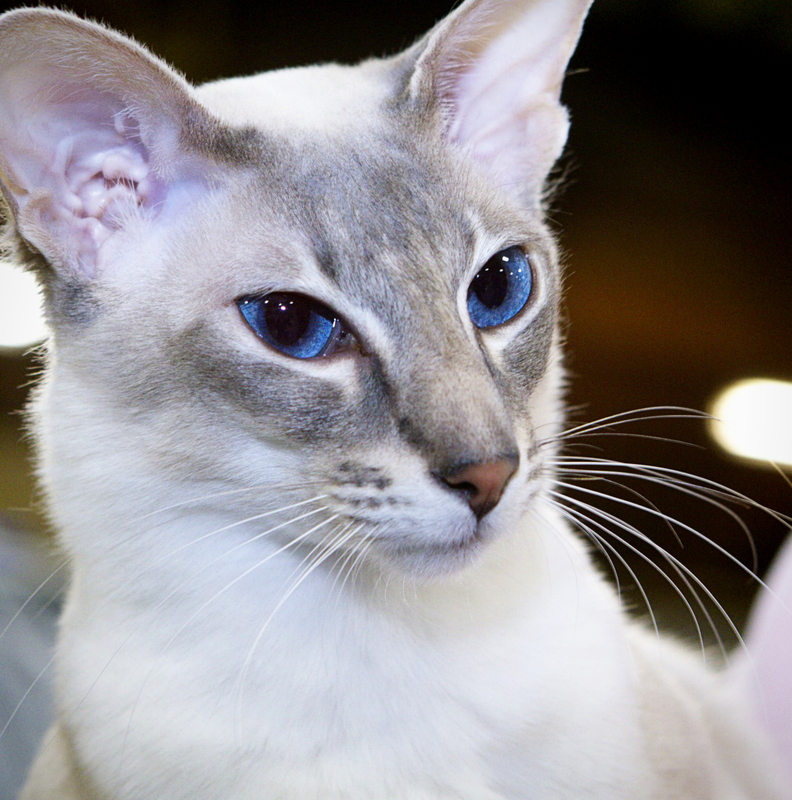 These two Oriental Shorthair Kitties, sometimes nicknamed ‘Ornamentals’ because they can be bred in over 300 possible colour and pattern combinations, are Jack and Lindy. 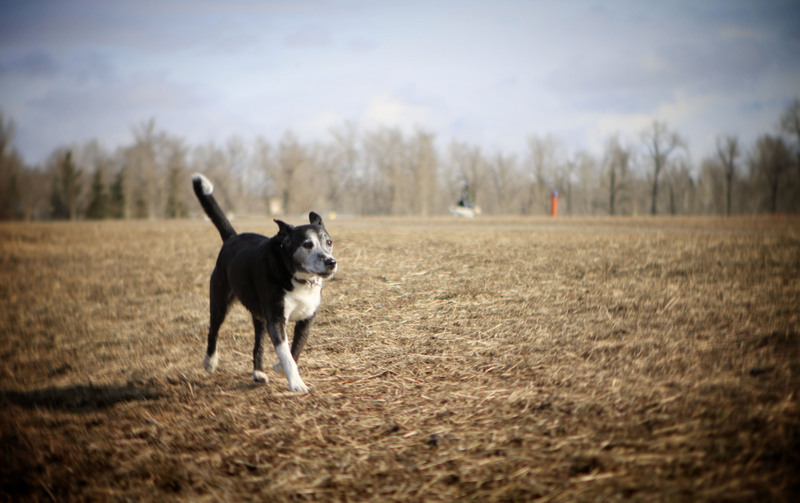 They are lovingly owned by Leslie and her husband David. Leslie and David do not breed their cats, they show them for the pure enjoyment of it and for the friendships they have made through the years. I have enjoyed getting to know all of these brilliant cats and their people. I have always loved cats and had two domestic shorthair cats myself, a brother and sister named Smucky and Tigger, when I was in my 20’s. They were great fun, always entertaining, and gave me great company. 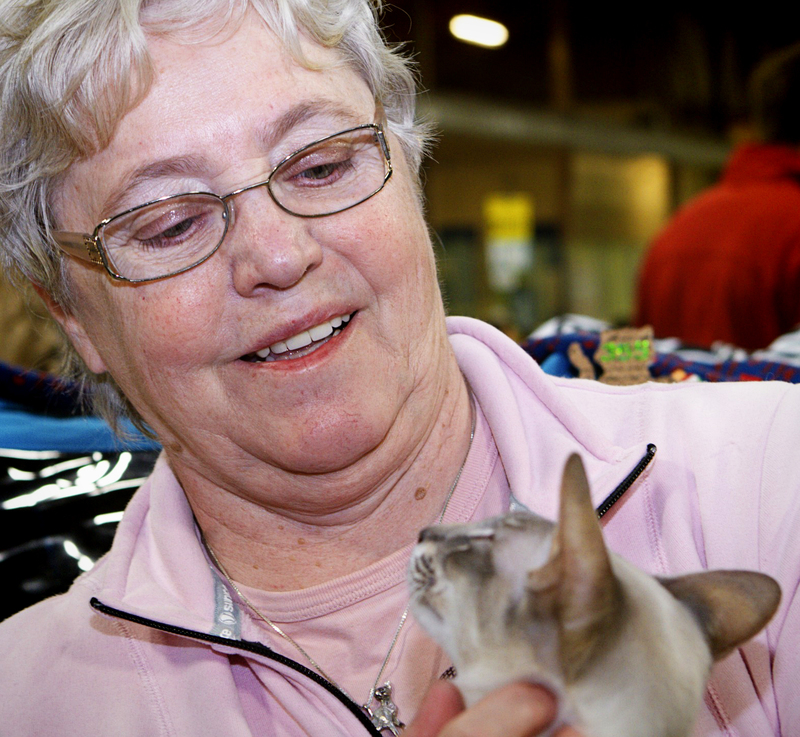 I want to thank all the fellow cat lovers I met and talked with at the Calgary Cat Show, I enjoyed myself immensely and learned a lot. 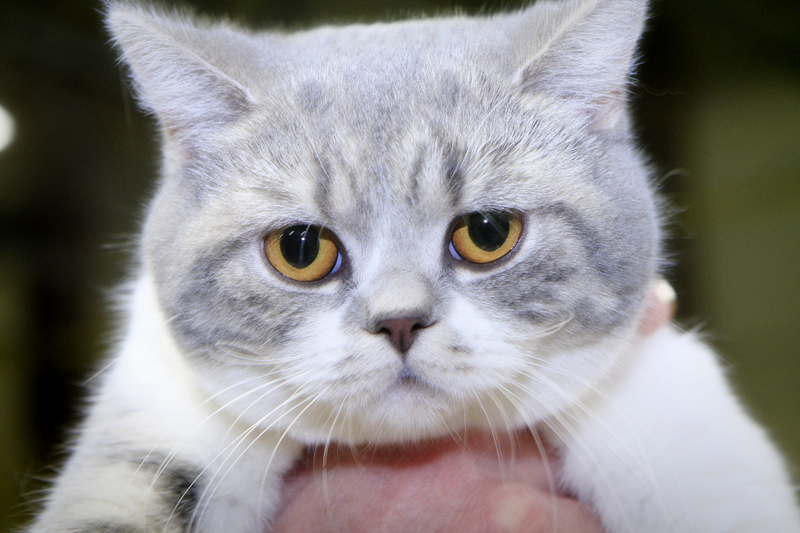 British Shorthair Kitties that is! I love these chubby faced, chipmunk cheeked, happy, smiling cats! 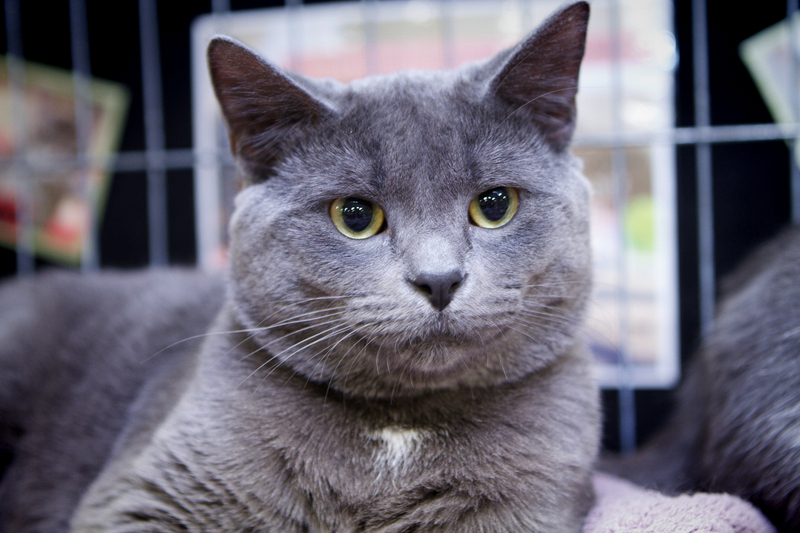 We met at the Calgary Cat Show; iBruiser and Blue Star were happy to come out of their comfy kennels to say hello and be admired. I can’t wait to introduce you to these three little cuties! 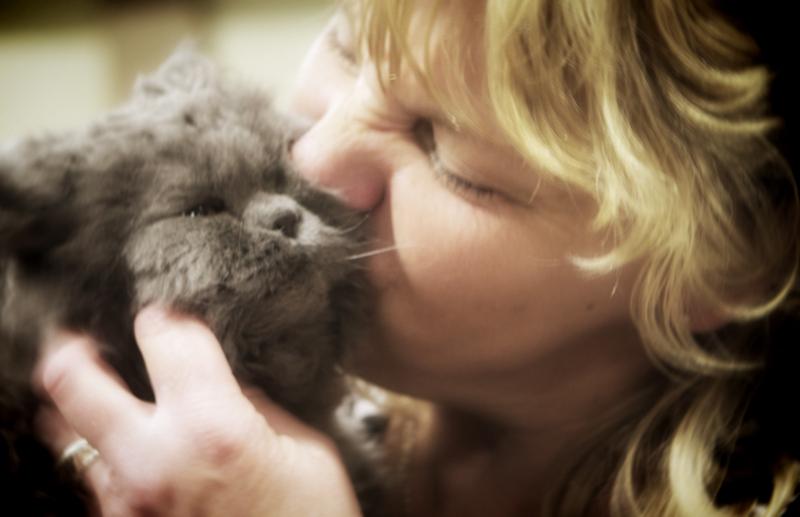 Meet Hawn, a Munchkin kitty, and Rudy and Hannah, two Selkirk Rex cats. 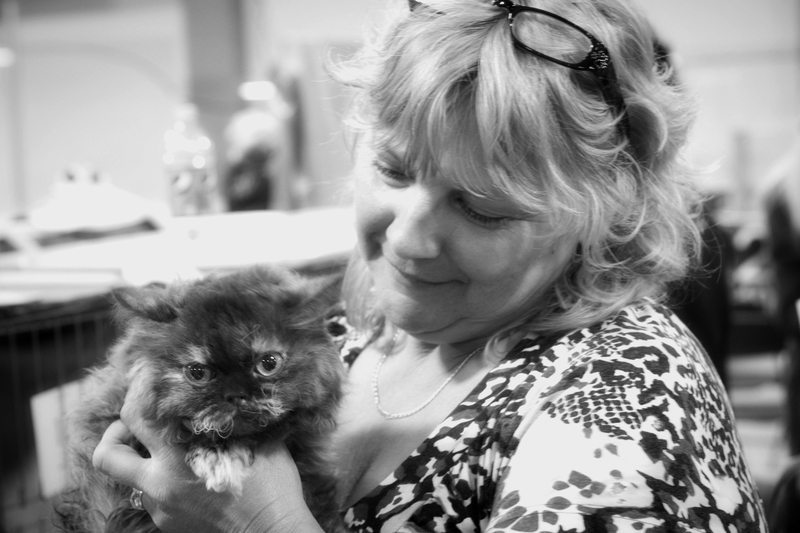 They are all so very loved by their person, Cyndi, who owns a Cattery and Kennel between High River and Nanton, Alberta. 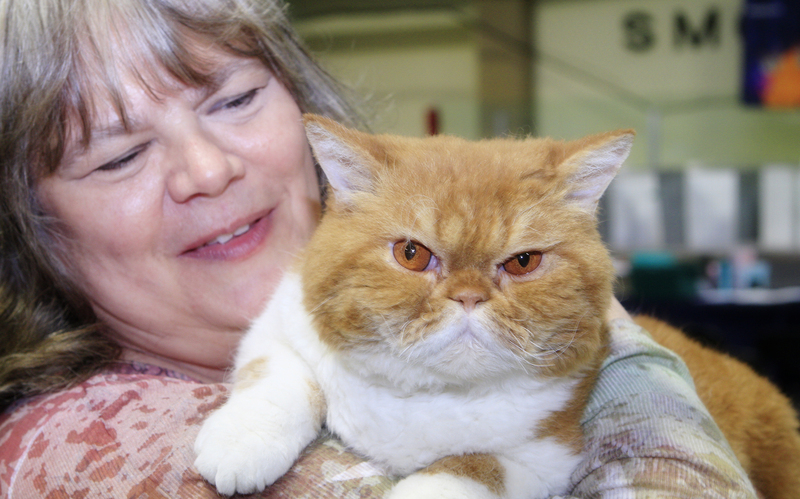 These were the first cats and their people that I met at the Calgary Cat Show. They were so kind to spend time with me and educate me as to what was going on at the Show (as I said before, I really had no clue). Click on over to my 100 Pets and The People They Love page to meet these three cuties and learn more about their interesting breeds. There are many more photos with their story. Oh this is a special little guy! 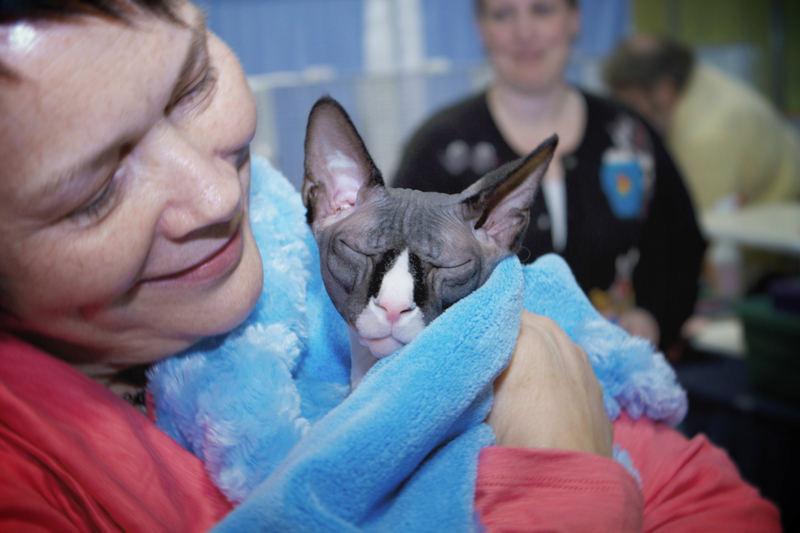 Jaxx is a 9 month old Tuxedo Sphynx cat I met at the Calgary Cat Show last weekend along with his person, Ethel. I watched him during his competition in the Best All Breed, Altered division and knew I had to meet him after he was finished showing. I was so glad to meet his person Ethel, such a lovely warm person, so willing to teach me lots about this special breed. Ethel shared a very special story with me that touched my heart. I am very thankful to have had the chance to meet them both and share their story. Head over to my 100 Pets and Their People to meet my latest additions! 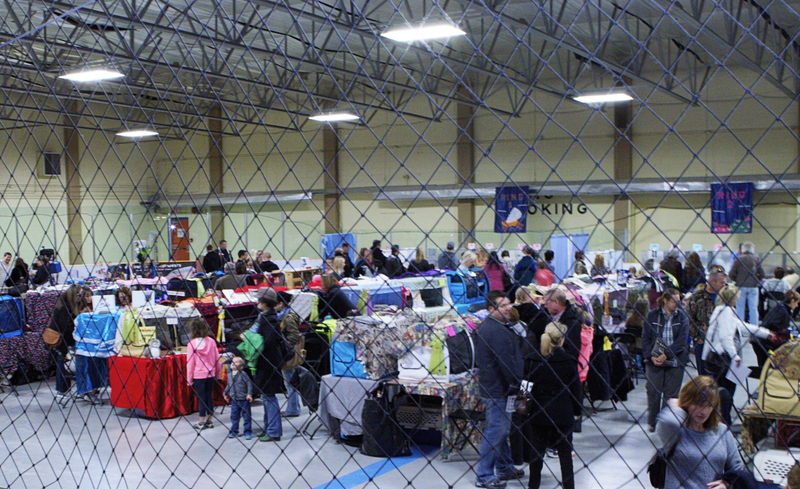 This past Saturday, April 20, I attended the Kitties ‘n Blooms, Championship and Household Pet CAT SHOW put on by the Calgary Cat Association and governed by TICA (The International Cat Association Inc.). 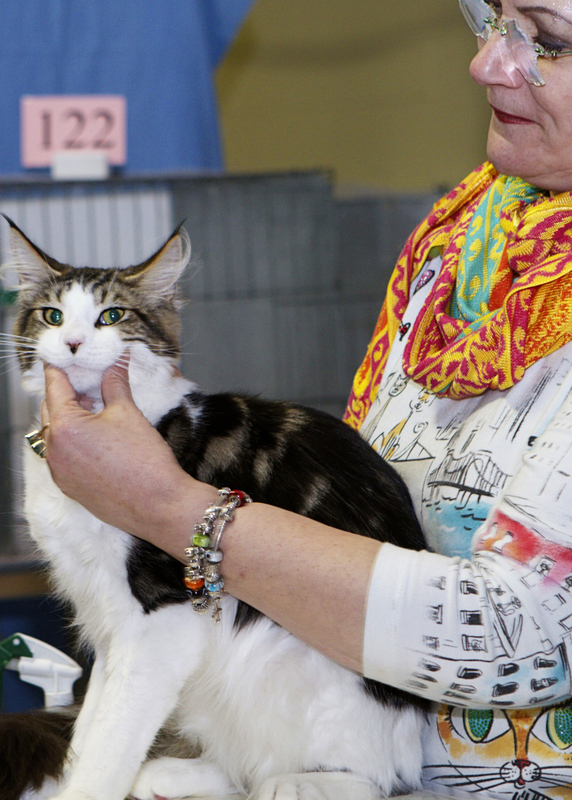 I wasn’t really sure what to expect having only ever attended a Dog Show as a spectator but I was more than happy to meet some kitties and their people, and, get educated on the world of cat shows. The way the rings are set up is quite different than a dog show, There are chairs in front of the judging tables and the spectators are welcome to sit and watch the judges handle the cats. 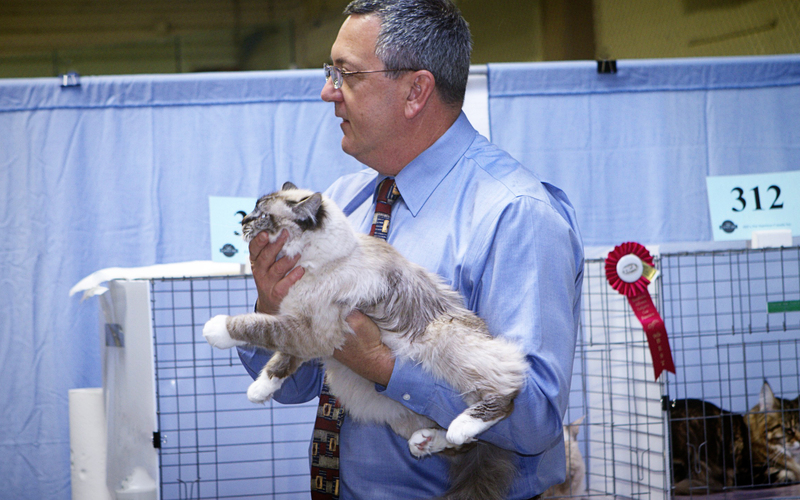 Questions are welcome in the ‘final’ rings when judges are describing the merits of the cats and awarding the plaques, but some of the judges do interact with the spectators during the initial judging process and some are quite entertaining and informative. There is a Judge, a Clerk and a Steward in each ring. The Clerk tracks the Judge’s decisions and the Stewards disinfect the cages after each cat is judged. The Judge cleans the table and his/her hands after each cat is handled as well to prevent the possible spread of disease. 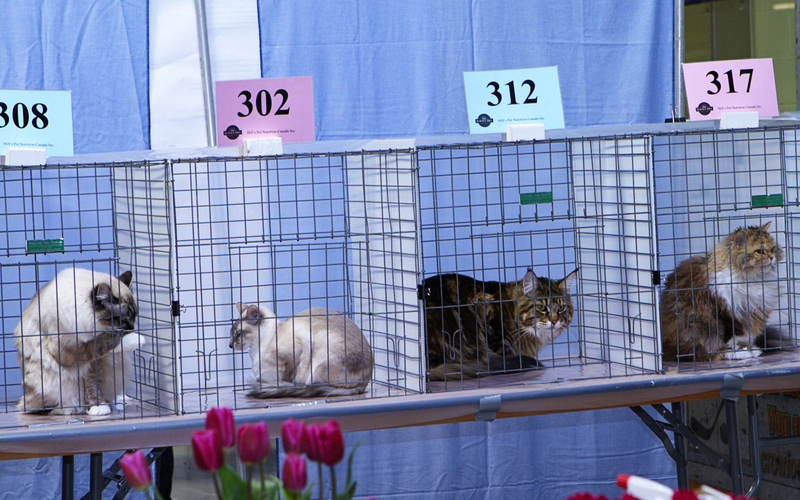 Numbers on cards in the Benching area (where the cat lives during the show when not being judged) and Judging rings indicate the cats’ classification (pink cards for females, blue for males). 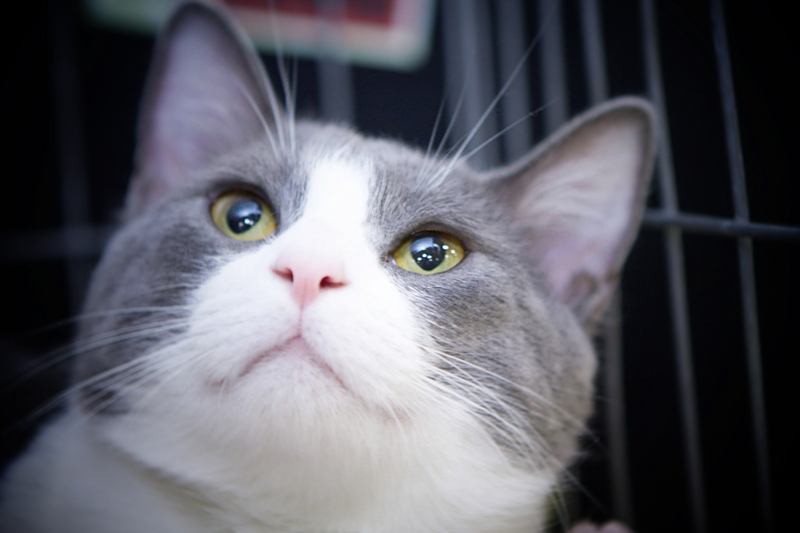 Classifications are divided for pedigreed kittens (4-8 months), pedigreed cats that can be bred, pedigreed cats that have been neutered or spayed and household pets. 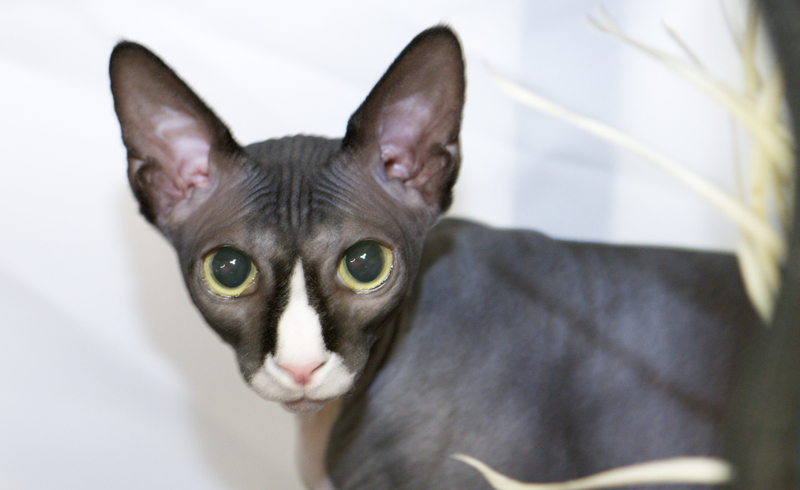 Each group is further divided into long or short hair cats or kittens. There is also a division for preliminary new breeds. (I know, seems all very confusing; I was confused for about the first hour I was there until some kind people took the time to explain everything to me. 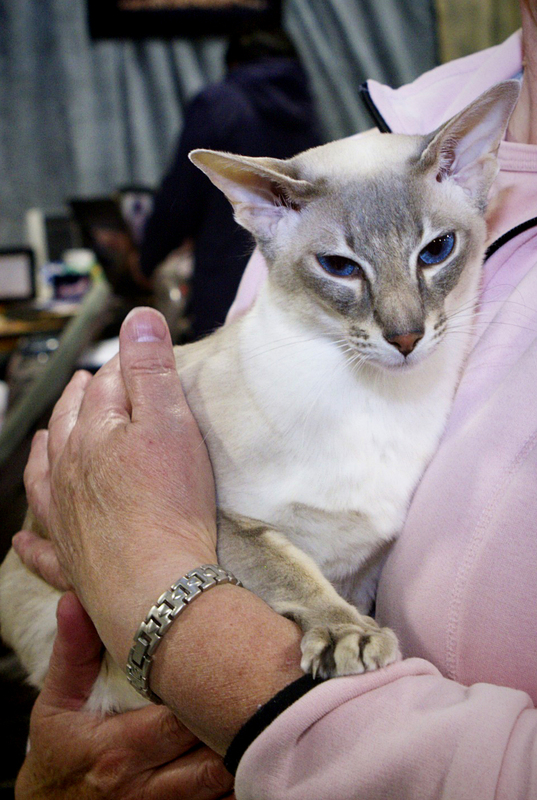 A more detailed explanation of how the judging process works can be found on the Calgary Cat Show or TICA websites. I loved the way the Judges interacted with the Spectators. I have to say my favorite was Mark Coleman of California (pictured above). 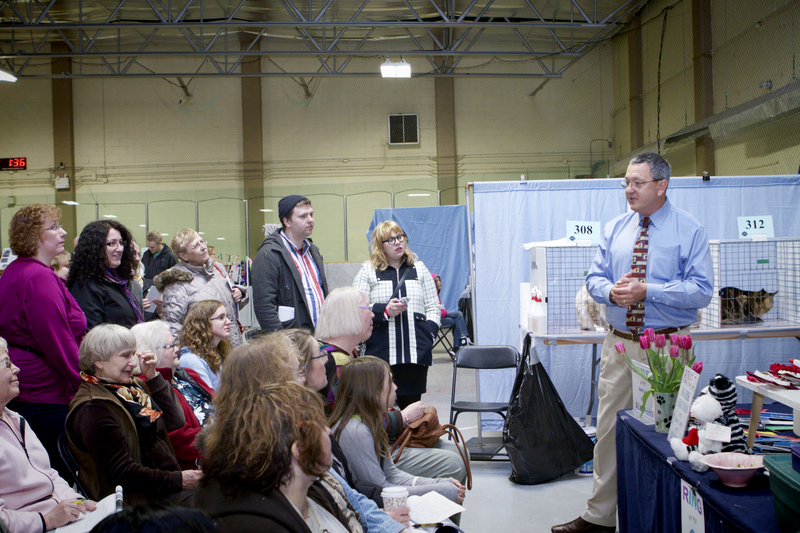 He was engaging, entertaining and very informative about all the different breeds he was judging at the Show. I was amazed at how laid back and tolerant most of the kittens and cats were at being handled so much however not all of them were in the mood to be handled and you did hear the occasional hissing, yowling and spitting going on. I met lots of great people and their cats here and you will meet some of them over the next week or so. 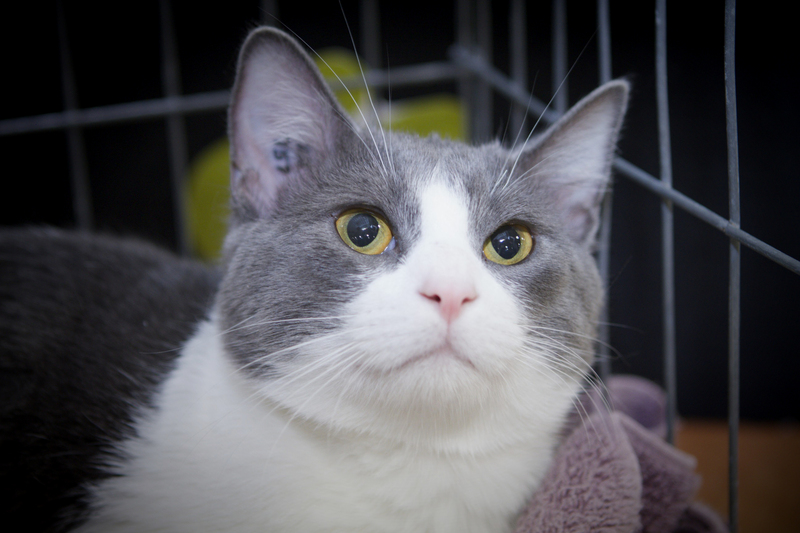 Today I wanted to talk about the show a little and also introduce you to three very special kitties that were at the show with the Calgary Humane Society and are up for adoption. 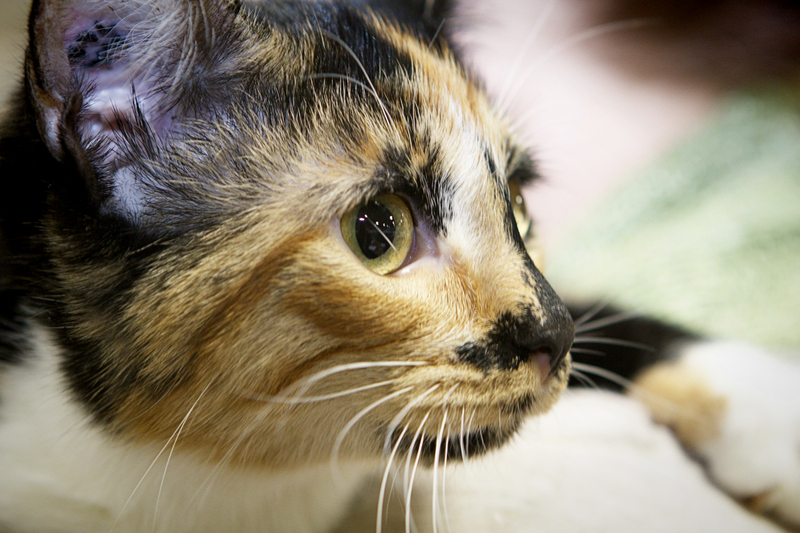 is an adorable 7 month old tortoiseshell female. She had just won a 3rd Place award in the Household Pet class when I met her. 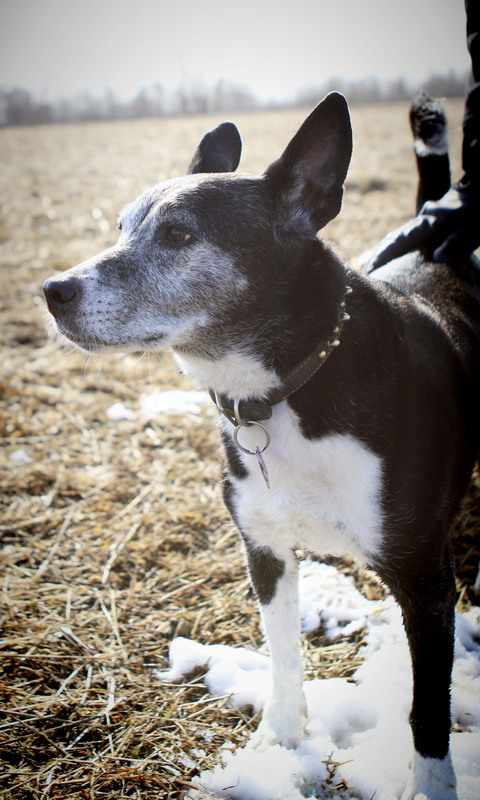 Tris was found wandering as a stray. 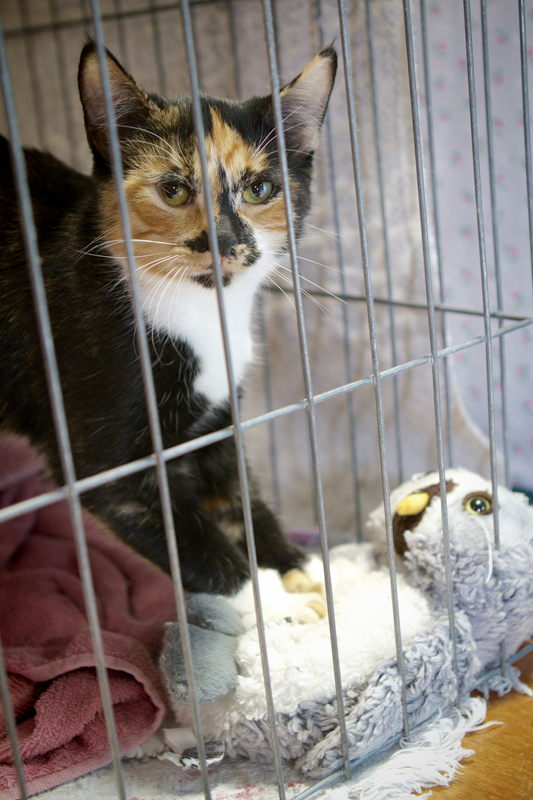 She is so sweet and had her little stuffed owl with her that she just loves. 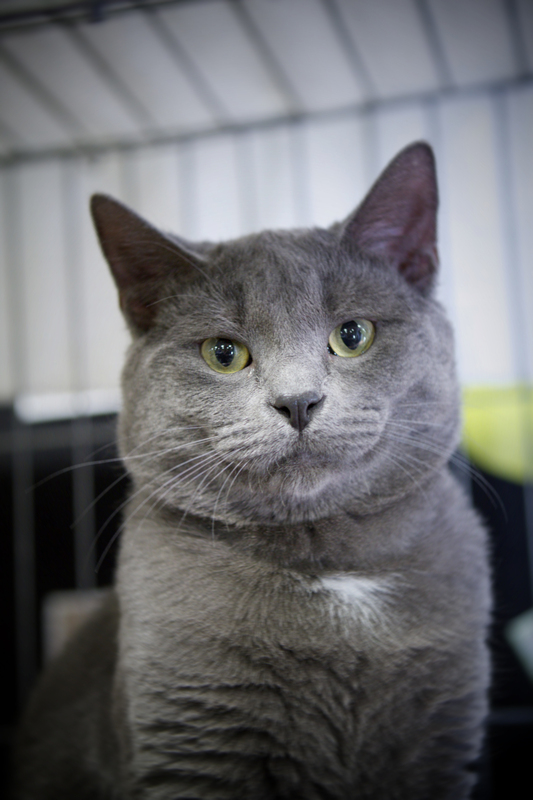 I am sure she would love to meet you, she is available for adoption at the Calgary Shawnessy Pet Value store. These two big boys are 10 months old and were surrendered by their owner. The Humane Society would prefer that these boys stay together if possible. 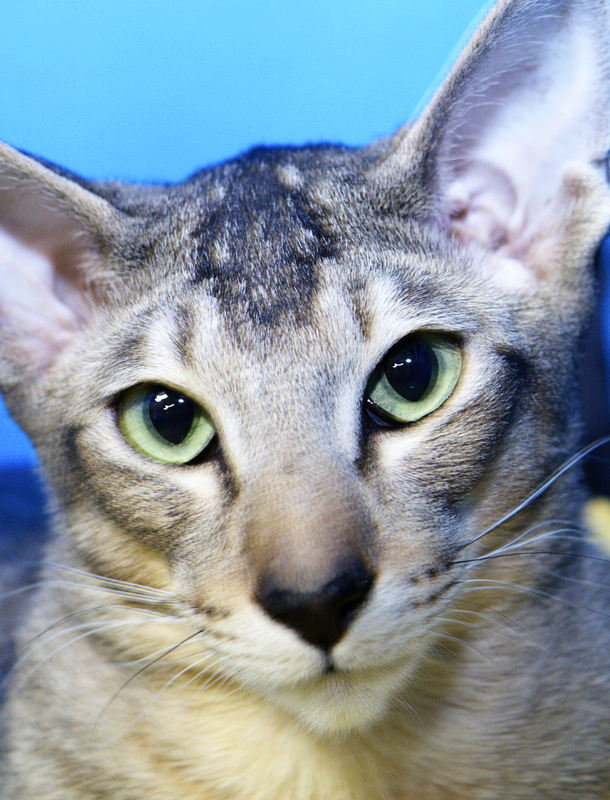 They are beautiful, calm relaxed cats and are very bonded. They would love to come live with you! I daresay this special little guy, Oggie, closely resembles his namesake, ‘Augie Doggie’, from the Hanna Barbera (1959-1962) cartoon series (in character at least). 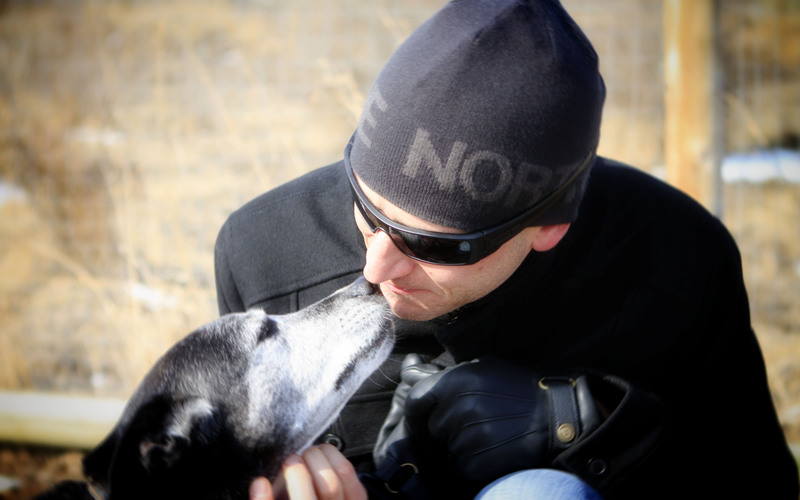 Both are high-spirited, intelligent pups, just wanting to make their dads happy and proud. 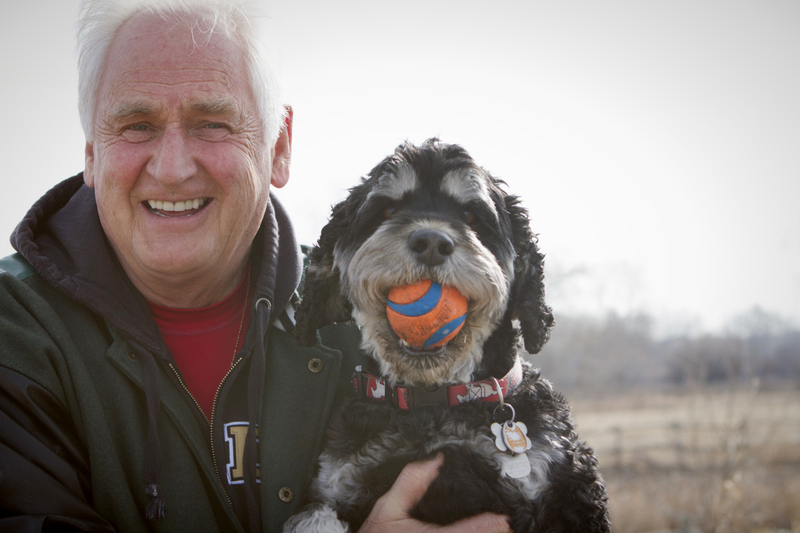 I met Oggie and his dad, Garry, at the Southland Off Leash Park last week. What a fantastic, happy guy he is. 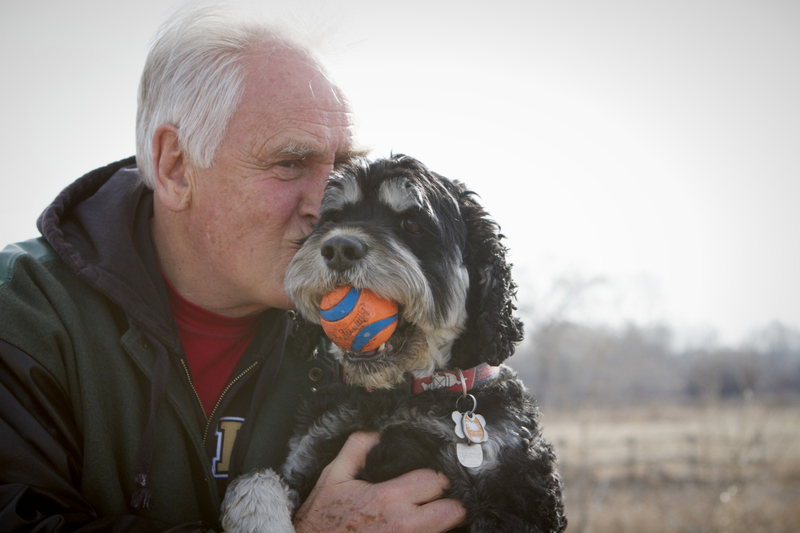 He loves his ball and his Dad (not necessarily in that order), he is outgoing and social. 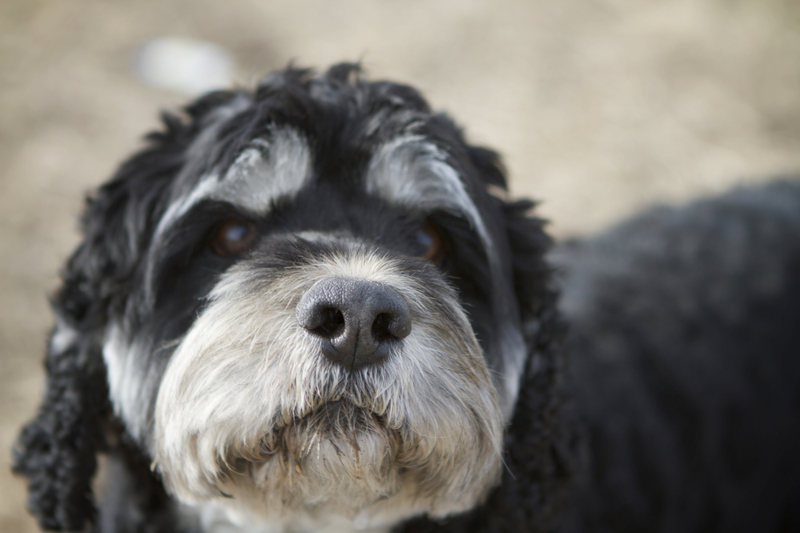 You can read Oggie and Garry’s whole story over on my 100 Pets and The People They Love page. I am so glad that Trinity and Trevor decided to change up their regular routine of walking at River Park Off Leash area and come to Southland Park, otherwise I never would have had the chance to meet and photograph them for my project! I knew right away there was something special going on between the two of them. Trinity got a real bounce in her step meeting all the dogs we had with us (my four, Emma & Rudy, two of my old dog walking clients, and Ron with his Molly, Max, Hector & Sadie). Trinity walked right in and said hello with confidence and a wag of her tail not the least bit intimidated by our 10! Not that our Pack are anything to be intimidated by. She wasn’t completely happy about all the fuss required to pose for a picture until it was time to show Trevor some love, but she certainly was happy to have a play with Max. The years dropped away when they did their little getting to know each other dance, it was wonderful to see. 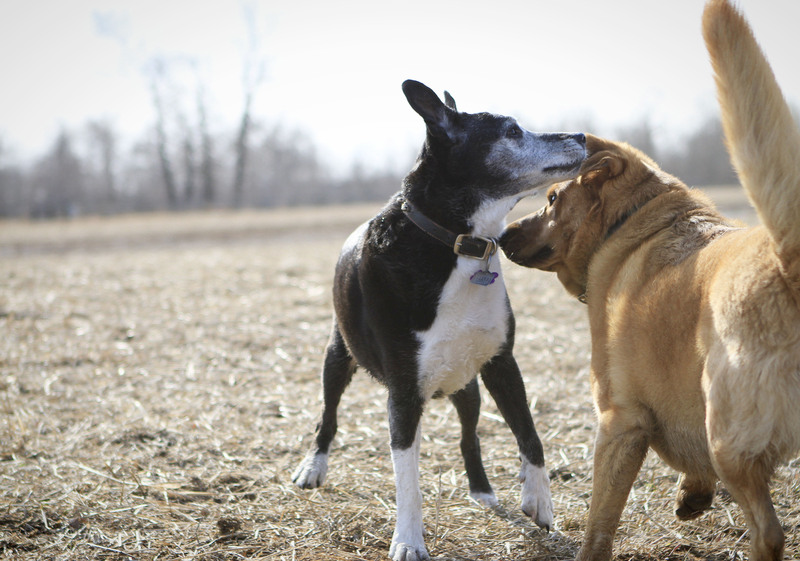 I believe the word ‘cougar’ crossed our lips when we saw her get her flirt on with the much younger Max. I got to capture a few special moments between both Trinity and Trevor as well as Trinity letting the years melt away, if only for a short while. Stop on over to my 100 Pets and The People They Love page to meet Trinity and her special guy, Trevor. So good to see Trinity living out her life in luxury with her best friend.